I’m not one to harp on crime statistics as a governing behavior for where I do my socializing, but this one’s too beautiful not to share. 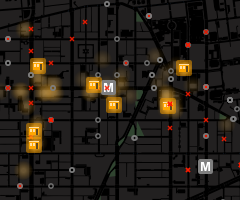 Check out Stumble Safely, which maps together a street map of DC, some delightful night spots, DC Metro station maps, and DC Crime Data. It even has settings so that you can filter by time of day or evening. It’s a gorgeous part of Apps for Democracy, a locally-organized contest for putting together a bunch of publicly available data into useful applications for the public.